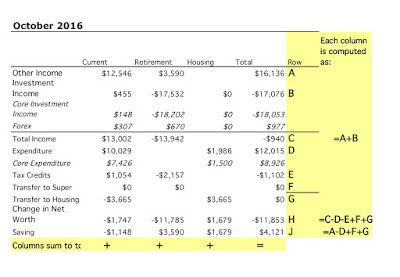 Spending (not counting mortgage) was high at $10k. I spent over $3k on an airfare to the US, which should be mostly reimbursed. We also paid for annual car insurance. Besides that there lots of relatively small expenditures on baby stuff etc. which all added up. Salaries, tax refunds etc. added up to $12k (after tax). After taking into account the mortgage payment of $3.7k (which includes implicit interest saving due to our offset account - the actual mortgage payment was about $500 less than this) - which shows up as a transfer to the housing account, we dissaved $1.1k on the current account. 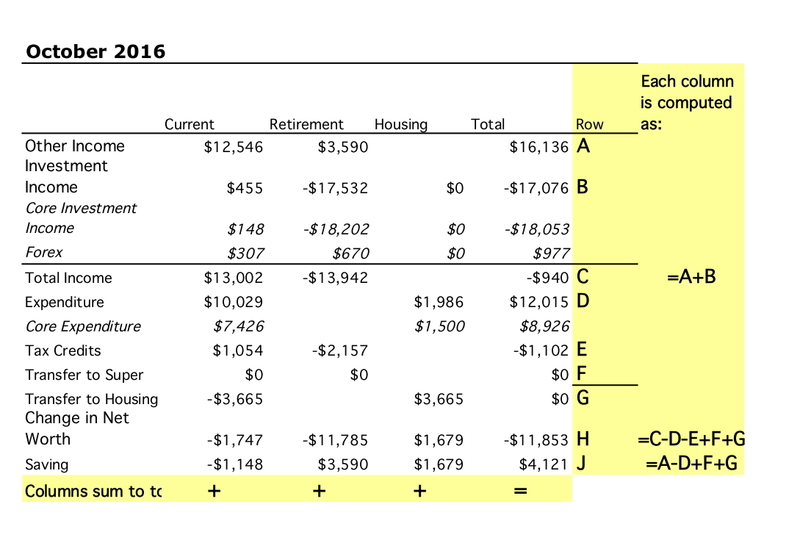 We made $3.6k of retirement contributions, and saved a net $1.7k in added housing equity. Net saving was, therefore, $4.1k across the board. The Australian Dollar fell slightly from USD 0.7665 to USD 0.7613. The ASX 200 fell 2.15%, the MSCI World Index fell 1.67%, and the S&P 500 fell 1.82%. We lost 1.22% in Australian Dollar terms and 0.27% in US Dollar terms. So, unusually, we outperformed both the Australian market and the international markets. The reason for this was largely the big gains we had in Oceania Capital Partners, which gained $8.7k. The worst performer in dollar terms was the CFS Geared Share Fund, which lost $15.5k. The best performing asset class in percentage terms was, of course, private equity, which gained 10.96% and the worst commodities, which lost 2.83%. As a result of all this, net worth fell AUD 12k to $1.604 million or fell USD 17k to $US 1.221 million.